Acura of Fayetteville has a lot to offer drivers, which is why we’re a trusted source for new and pre-owned model service at a special price. No matter if you’re looking for a specific Acura service or simply want to check out some different options that match your style, we’re the place to find what you’re looking for, and here’s why. 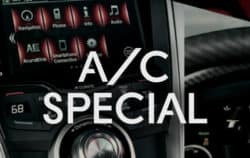 We’ve got the best service specials for you! Plus tax. Cannot be combined with any other offer. Get ready for those Hot Summer Days! WE HAVE GREAT SERVICE SPECIALS. Buying a vehicle today means making a major financial investment, but having a new car shouldn’t put you in a financial crisis. Instead, you need to choose the dealerships that offer the best vehicle service at the best prices, and that’s what Acura of Fayetteville does. We not only provide you with high-quality Acura models, but we also deliver impressive service specials. We make it as simple as possible to keep to the Acura service schedule. We have the best service specials in the Fayetteville area. Stop by our dealership today to see our current new inventory specials and peruse what is available for you. Have any questions about when to rotate tires or why your brakes are squeaking? We’ll walk you through common Acura maintenance issues.